Major policy changes implemented by President Xi underlie U.S. concerns. In some modest form, populism with Chinese characteristics influenced these changes. For example, increasing nationalism resulted in policies to dilute foreign influence and assert sovereign independence. One example of this nationalistic thrust came with President Xi’s ambitious Made in China 2025 (MIC2025) program (see Figure 1). That policy will likely lead China to consolidate the number of SOE’s into fewer but larger ones. Then, to implement MIC2025, the SOE’s will receive a substantial portion of state-funded subsidies totaling over $100 billion (see Figure 2). President Xi’s crackdown on corrupt practices could also represent another form of populism with Chinese characteristics. Similar to the demands of many American populists, China prosecuted elites who gained an economic advantage from their past special entitlements. 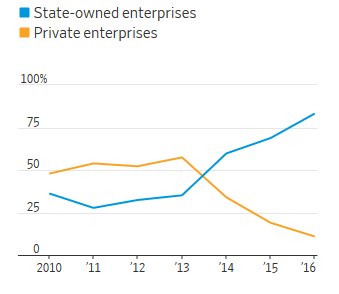 These actions squeezed the power of the private business elite to the benefit of the SOE’s reducing breadth of choice in various Chinese markets. President Xi’s policies increased the power of what U.S. populists call “the swamp or deep state”. Very simply, the government reaffirmed its central role in economic planning. He then extended the role of both the government and Communist Party further into SOE’s. For those who expected China to liberalize its economy after joining the World Trade Organization (WTO) in 2001, this direction just adds further to their disappointment. By increasing the role of the government and Communist Party in SOE’s and the SOE’s role in the economy, some observers suggest it might reduce their competitive and economic incentives to improve productivity. A recent Barron’s article cited the conclusions from a Japanese professor’s study, which showed that declining Chinese productivity and efficiency reflects “the government’s widespread and persistent interference in investment decisions” (see Figure 2 again). 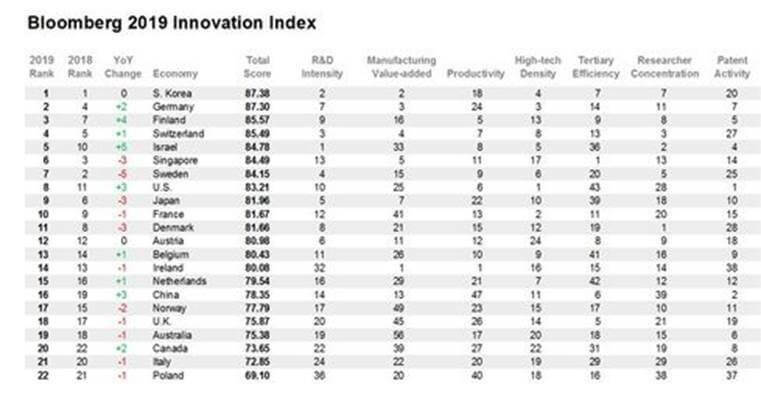 As further evidence, Bloomberg’s 2019 Innovation Index ranks China 47th globally in productivity (see Figure 3). Anti-monopoly laws in China can provide privileged roles for SOE’s as administrative monopolies in what the government calls a socialist market economy. Absent limits imposed by market-based competition, SOE’s, subsidized by government loans, can wind up with output exceeding market demands. A classic example of that occurred in 2015 when the Chinese steel industry contributed nearly 50% of the global overcapacity in that industry. 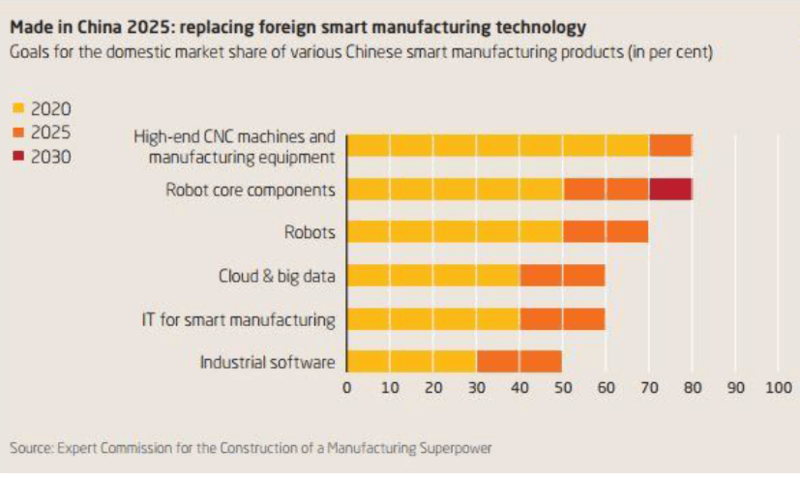 With some Chinese industrial sectors not held to the fire of competition, their competitors outside of China could face two possible outcomes. Either, they may gain competitively from their greater relative efficiency or suffer from oversupply in their markets. Finally, protecting American intellectual property represents a key goal for American trade negotiators. For example, in her book on China— The Third Revolution – the author Elizabeth Economy cites this example: “one of the most onerous requirements for foreign firms was a measure that permits Beijing to access computer program source code which is considered highly sensitive intellectual property.” Such requirements pose difficult choices for American companies in determining whether to operate in the second largest global economy or not. Ultimately, if China does not offer greater intellectual property protection, businesses, not just American ones, may move their operations to other countries and regions or develop a workaround solution. China recently reported that 2018 gross domestic product (GDP) grew 6.6%, representing its weakest growth rate since 1990. Many skeptics of the government’s figures believe China’s actual growth came in lower. The International Monetary Fund’s latest World Economic Outlook projects China’s GDP growth rate in 2019 and 2020 will likely come in at 6.2% for both years. Maintaining social stability and therefore avoiding political unrest remains the bedrock of the Chinese leadership’s economic policies. Therefore, China will likely make every effort—including a trade settlement—to re-stimulate its economy. On a lighter note, the Chinese new year celebration — February 5th to the 15th – the year of the pig—will add, as it always does, short-term economic data distortions. Recognizing these difficult issues faced by the negotiators, we retain our cautious optimism that the interests of both Presidents Trump and Xi would lead to a trade agreement. For President Trump, those interests include avoiding an economic slowdown before the 2020 presidential election. For President Xi, to reverse the Chinese economic slowdown. With that, some short-term solution seems in the cards and of course accompanied by positive headlines. Those headlines will likely mask unsettled issues to be resolved at a later date. No matter, investors will respond favorably and the resolution should positively influence both financial markets and the global economy. Besides the United States and China, the economies of Japan, South Korea, and Germany should particularly benefit with the importance of China to their exports. At a micro level, stocks of U.S. companies pulled down by disappointing earnings resulting from their Chinese operations should see an upside bounce. Unfortunately, if no resolution results from the series of bilateral talks, our 10/24/2017 commentary, “Will The Trade War Between the U.S. and China Grow Into Cold War II,” deals with that possibility.